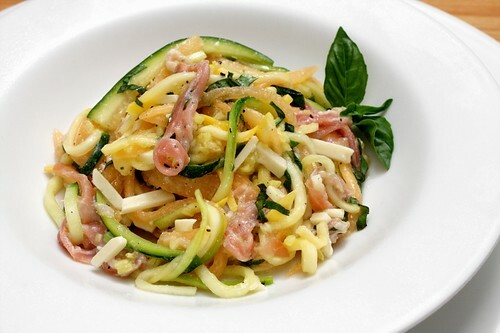 raw yellow squash and zucchini spaghetti with prosciutto basil and melon, originally uploaded by aarn! +29th July, 2010+. sliced 1 1/2 zucchini and 1 1/2 yellow squash into eighth-inch strips, first by using a mandolin and then perpendicular by hand. placed the medley in a colander and sprinkled with 1.5T. salt. tossed the squash to distribute the salt, then let sit for an hour to sweat off excess moisture (leaving the salt on the squash provides salt for the whole dish later. usually you would rinse cabbage after it is sweat in a similar manner). made thin strips out of 1/2 of a small melon, using the same technique as the squash. tasted the squash to make sure that it was not too salty. added the melon strips to the squash strips, along with 3-oz of thin-cut prosciutto sliced into narrow ribbons, 3T. of thin sliced basil, and 1/4-lb of parmesan, also cut into similarly sized strips. mashed up 2-cloves of olive oil poached garlic, 1/2T. honey, and 1T. of thinly sliced fresh basil in 1T. of the olive oil that was used to poach the garlic initially (garlic olive oil). added 1T. extra virgin olive oil, and then whisked in 1.5T. of lemon juice until emulsified. mixed fresh cracked black pepper, and 1T. of whole milk ricotta into the emulsified dressing. gently incorporated all of the ingredients and the dressing using bare hands, then served on chilled plates.